While I was in Dingle last weekend as part of the Dingle Food Festival I got to visit the newly opened Dingle Brewing Company whose single brew – the Tom Crean lager – is already being brewed at full capacity despite only being launched in July. The brand and its application across a variety of media is really impressive. What follows is the story of that brand development by MidPoint Creative in Tralee – written by Steven Ruane. It is long and comprehensive so thanks to Steven for taking the time to share it. 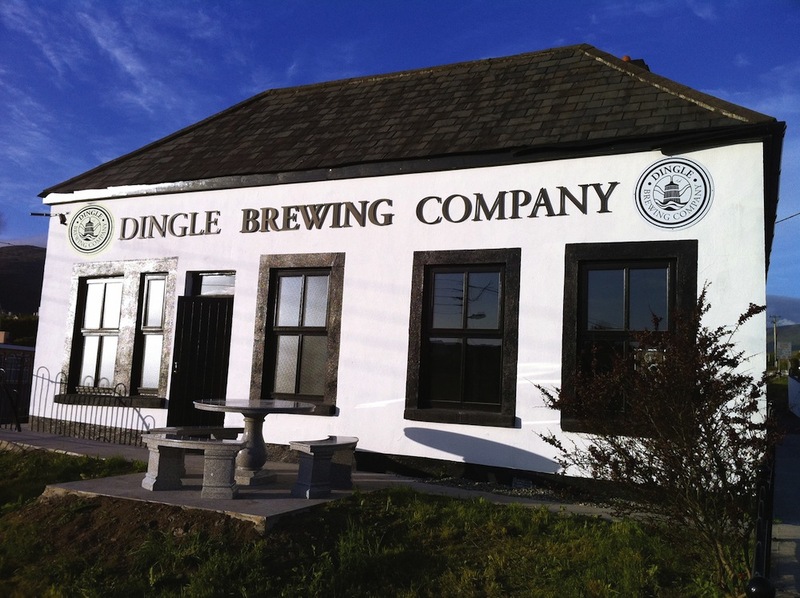 We met with the owners of the Dingle Brewing Company at the very start of the project. They informed us of their plans regarding the product, the premises for their business and their business plan. On meeting the directors of the Dingle Brewing Company we soon discovered that they had a very clear vision. They wanted to produce a premium lager that would appeal to a wide market. One product made right. They wanted their product to be truly Irish and for the Irish. The pub trade in Ireland has been suffering for a number of years and they wanted to produce a product that would bring people back to their local pubs, a product that would be enjoyed in good company and in the warm friendly atmosphere of the local. They made it clear to us that they were going to produce the product naturally, using only the finest ingredients and with the minimum intervention in the brewing process. They had acquired a premises in which to brew, a premises which was full of character and history and which would fit in perfectly with their values and vision. Create and develop brand identities and supporting material for the overall business and related product(s). Carrying out research into the brewing and craft beer industry was a big challenge but one we were prepared to make the sacrifice for. Purely for research purposes we had to spend a lot of time in bars. We spent a lot of time staring at beer mats, beer taps, different brand marqs and imagery used in other breweries. We also asked the opinion of bar workers. As the product was going to be only available in bars it was vital that we got their insights into independent breweries and how their customers reacted to same. At our first meeting we had a long discussion with MD of the Dingle Brewing Company, Jerry O’Sullivan. On that first meeting we also got a tour of the site, ‘site’ being the operative word. We were shown around what used to be the Dingle Creamery building by Jerry. During the site visit, Jerry explained to us his plans for the business and the premises. It was very clear from listening to him speak that he had a crystal clear vision for the project. From a brand building point of view this is the best foundation you could hope for – a strong clear vision. On leaving the site that day we had no doubt that if we could express that vision in a creative way that this would be an extremely interesting project. With this initial stance we prepared a brand platform document outlining the vision for the venture and setting down the foundations for how we were going to portray and develop this, both strategically and creatively. Adding this to the other general research we had done on how other brands visually present themselves we got busy sketching. The image of the brewery building, being situated as it is, at the foot of the Conor Pass in Dingle was hard to escape. Other striking aspects of the brewery were the rich, dark wood casks that were part of the brewing kit and the sound of babbling water for the stream which flowed at the side of the brewery building. These images seemed to encapsulated the feel of the brewery. The brand marq is made up of representative imagery. The client liked this and felt it fit in better with the ethos and feeling of the brewery. We used simple representations of the major features of the brewery, mainly the landscape and the brewing cask. We wanted to give the overall impression that this was Dingle itself being passed through the brewery and brought, via the lager, to the end customer. We kept the imagery simple and uncomplicated to reflect how the Dingle Brewing Company intended brewing. We also had to keep in mind that this brand marq was going to be scaled up and down for use on everything from large outdoor signage to small merchandise items. With one or two small adjustments the client was happy with the brand marq. With the brand marq signed-off we started working on developing he identity. As mentioned one of the memorable images we had of the brewery was the dark wood that the casks were made of and which was accented as part of the brewery building itself. We decided to use an image of this wood as a backdrop for the brand marq and as a background for the associated marketing material. It worked well with the darkness of the wood providing a good contrast against the mainly white brand marq. It also gave a good indication of the atmosphere of the brewery for those who would see the material without having visited the brewery. We also got to work on other supporting material, from outdoor and ambient signage to flyers and brochures right across the board to t-shirts and other merchandise that would be available in the brewery gift shop. At the moment we are just finalising the web site design and hope to have this online in a couple of weeks. We, and more importantly, the client, are very happy with how it is shaping up and are looking forward to seeing the reaction it gets from users. The guys at the brewery had a very simple business plan. Instead of going fo a range of products they were going to produce one product and put all effort and concentration into making that product a premium one. They had decided to brew a lager and they were going to name it after local hero, Tom Crean. We were delighted with this name. Through his many feats of bravery and endurance Tom Crean had reached almost mythical status. The fact that he was from nearby Annascaul, Co. Kerry gave the name all the more relevance and resonance. We felt that there would be great creative scope here to create a really memorable identity for the lager and the supporting material. The Dingle Brewing Company wanted an image that would reflect the care and effort they were putting into getting the lager just right. They also have a great deal of respect fro Tom Crean, the man, and wanted this respected to shine through in the identity. We set about researching the man. There was so much to this quiet, stoic, character who went from the village of Annascaul to being a valued member of expedition teams for both Scott and Shakleton and ended up being heralded as having carried out the greatest feat of human endurance. After his naval career he quietly retired to his home village where he owned and ran the South Pole in until his death in 1938. There was a lot we could have worked with but sticking to the ethos of the brewery and the character of the man himself we wanted to make the identity simple, uncomplicated, understated and interesting. We had thought about a hexagonal shape for the identity, based on the shape of the Polar Medal, 3 of which were awarded to Tom Crean for his various feats. We had not seen many bar taps or identities of this shape and thought it would be a nice way to honour the hero. As a second option we thought of an explorers compass. The circular shape of a compass also sat well with the brand marq for the brewery. After discussions with the client we developed the ‘compass’ option. What could be more evocative of discovery and exploration?. We went through many versions of a compass graphic, some too complicated, some too modern. We eventually settled on a very simple version with only the North and South points showing. We placed the compass slightly off centre in a nod to a ships chronometer and to give the feeling the the needle was moving back and forth. 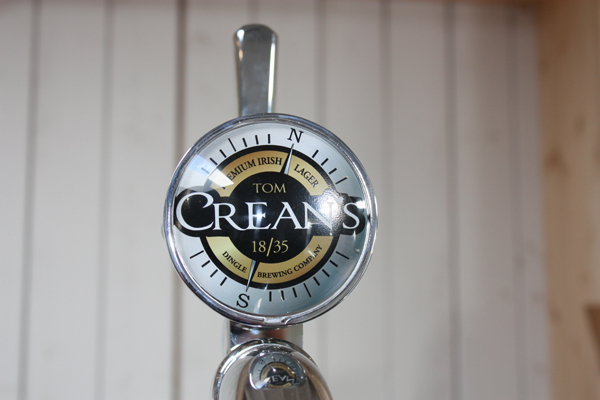 For the name of the lager we wanted to accentuate ‘Crean’s’ It was the vision of the Dingle Brewing Company that the customer would walk in to the bar, nod a t the barman and ask for ‘a pint of Crean’s’ To this end we made ‘Crean’s’ the focus of the identity, with the first name Tom resting in smaller type on top. For the typeface we wanted to used an old fashioned, classic looking, serif font, as would have been seen in newspapers and posters of the time. we felt that using all uppercase letters spoke to the strength and unwielding nature of Tom Crean. Once we had the main elements decided on we added some distinctive character elements. On reading accounts of Tom Crean there were many comments on how he never asked for much and how much he would enjoy his pipe. We wanted to incorporate this in some way and after playing around with it for a while we used a pipe graphic as the apostrophe in Crean’s. Another little fun item we added is the 18/35. This has already proved to be a great conversation starter when people see the identity or as they are holding the glass. Was it the year he was born/died? Was it the year of any of his voyages or the year he retired?. In Antarctic conditions and surviving only on 2 sticks of chocolate Tom Crean set of on a 18 hour trek over 35 km, a feat of incredible endurance and all to save the life of his 2 colleagues. We had to mark this in some way, so without much fuss or fanfare we nestled the numbers under his name. It still gives us a kick to see people noticing the number for the first time a theorising about what they mean. For the colour palette, with the imagery of medals being in our minds we stuck to silvers and golds. We felt these also added to the premium feel that the client was hoping to achieve. Once we had the 2 identities finished we set to work on all manner of support material. Beer mats, bar taps, exterior signage, flyers, tent cards, posters, t-shirts, merchandise, web and social media, even right down to working with the clients on choosing and branding the glass. For the supporting material we need a strong but engaging tagline. Given the provenance of the name of the lager and all that entailed coupled with the entrepreneurial spirit of the guys in the brewery we settled on ‘Discover Crean’s’. Simple and effective, it evokes the imagery associated with exploration while letting people know that this is a new lager worthy of discovery. We also need a primary image to accompany this tagline on the marketing material. Given Tom’s amazing trek, we decided on using a footprint in the snow. The client was very happy with the footprint image. in one simple image it evokes the mammoth task which Tom crean undertook. The bleakness of the footprint in the snow contrasts nicely with the warm hue of the lager. it all came together for us when the lager officially launched. The Dingle Brewing Company were aiming for the first brew to be ready mid July and it was. 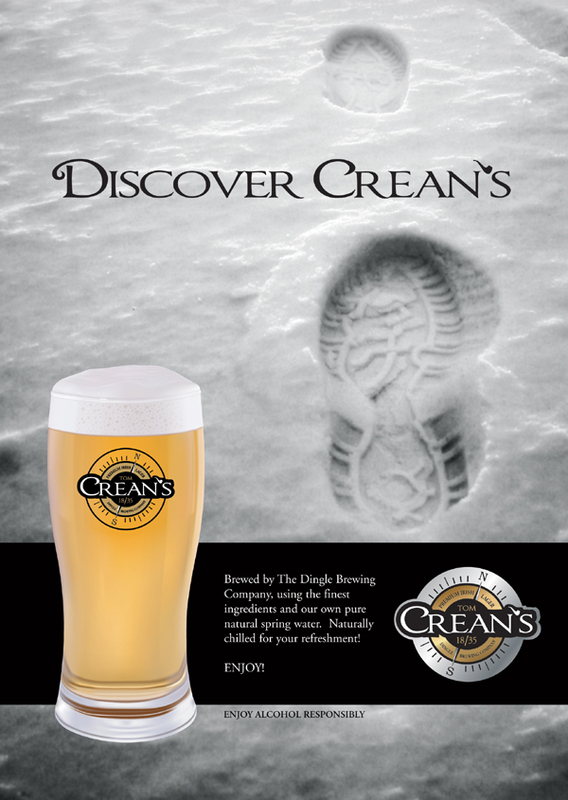 As if fated, Tom Creans birthday is on the 21st of July so after putting our heads together with the client we decided that the only place in the world that this lager should be launched is in the South Pole Inn Annascaul. So on 21st of July 2011 the first pint of tom Crean’s premium Irish lager was poured from the taps in the South Pole Inn, once owned by the great man himself, and the time of the first pour.. well that was twenty five to seven of course i.e 18.35. Thanks for that Steven. You can see the other posts in this Food Brand Design Guest Post series here. ← Foodcamp 2011 @SavourKilkenny. What is it and why would you enjoy it? It was a great project with loads of scope, so that made it very easy to write on.